I'm Jessica, I publish Everyday Party Magazine, an online magazine with an emphasis on DIY and budget friendly parties for everyone! I am so excited to share this simple and affordable DIY with you all for Halloween! I love Halloween, but often times I can't just go out and buy all the decorations I want, so my husband and I make a lot of them. 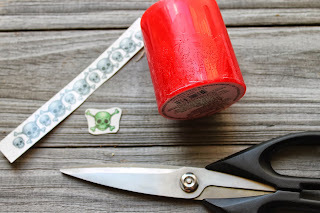 The DIY I am sharing today will cost less than $5 and take less than 5 minutes. First, gather your supplies, then cut out your desired tattoo as close to the image as possible. Next, remove the clear protective cover from the tattoo and place tattoo on the candle. (You can move it some, but not too much, or it may not stick well) Finally, take your rag, and dampen it in the bowl of water, and hold over the tattoo, just as you would on a person, and hold for 30 seconds. 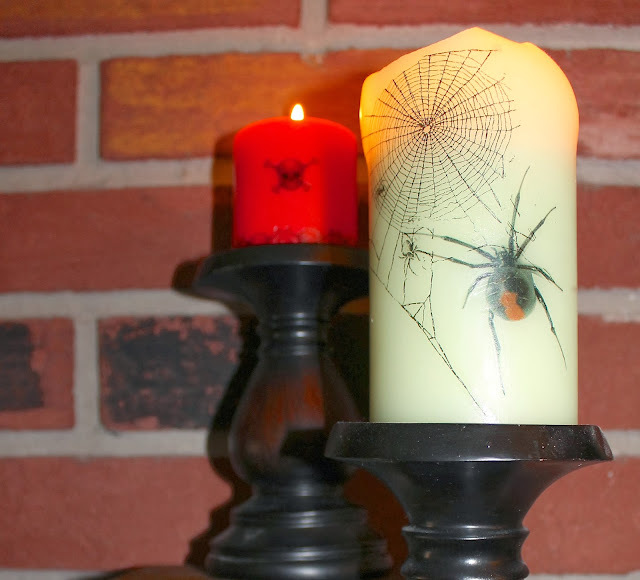 Now, you have a custom candle to match your Halloween decorations for very little money. And, if you have little ones, they are happy because you have left over tattoos for them to have! I used temporary tattoos last year for the first time on the "back side" of a candle and it is still there! I simply turn the tattoo and have it face the wall during the rest of the year. Thanks Keisha for letting me share! Jess, this is such a good idea! I'm already thinking of all the other holidays or fun events I can use this for. Thank you!! !